WELCOME to Wally Wood Ministries | "An end-time discipling of last day disciples!" A plaque that fell to my feet in a department store in 1975 in Oklahoma City. It was my first time away from home in Houston. <– For more pages on this site, click on the Menu Box to the left. Rev. 13:15 (NAS) predicts that “it was given to him [ the ‘false prophet’] to give breath to the image of the beast, so that the image of the beast would even speak and cause as many as do not worship the image of the beast to be killed.” In a world of over 7.5 billion people, how will they know who is worshiping and who is not … unless …? 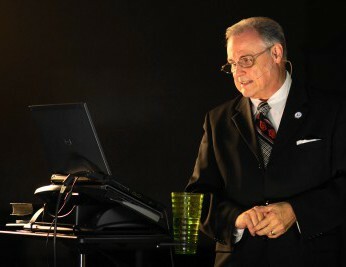 A collection of Wally’s appearances in speaking engagements, radio interviews, YouTube videos and a TV pilot he produced at KETH public television in Houston in 2015. Wally’s experience as a print and broadcast journalist extends as far back as 1972 as he worked for both a local radio station and a local newspaper. Those venues opened doors for him in religious broadcasting starting in 1975 and ran through the mid-’80s. From the early ’70s to 2013, he also covered the space and hi-tech industries through the groups he started: The Shuttle News Service (1986), the Space & Telecom News Bureau (1987), and most recently, the National Space & Technology Association (2003-2013). Through it all, he never lost focus on his life’s mission: To research and report the global signs and trends heralding the soon return of Jesus Christ (Mat.24:33-34). Even today, he continues to bring into biblical focus and prophetic clarity today’s unfolding developments. Click on the icon above to “The Wood News Group” to begin your tour of this expanded outreach. Wally Wood Ministries is a 501(c)3 tax-deductible non-profit ministry based in Houston, Texas. All tax-exempt donations can be made either online by clicking HERE … or by regular mail, sending checks made to Wally Wood Ministries, to P. O. Box 42005, Houston TX 77242. Thank you for your love, prayers and support. I’ve just finished reading The Mystery: Heaven’s Secret Story and it was amazing! I couldn’t stop! This book is filled with scriptures and it’s easy to read and understand. It made so much sense to me! I recommend! Wally Rocks! I was surprised when he first told me the gist of the story behind “The Mystery” verbally. To finally get a copy, I read it in two sittings. In my many years walking with Christ, I had never heard or read a Biblical interpretation like this. You are there pre-Genesis, when the Holy Trinity make their move to create and redeem. Had the world powers known this mystery, they would not have crucified Christ. They would dare not, because it would have sealed their fate. But, their mistake ensured our destiny and salvation. Their trap was set and we are free! The Native Americans call God “The Mystery.” Now I understand. Wally has been called of God to reveal what occurred before creation. It was never revealed to Lucifer and his demonic hosts what the plan was…..and now its too late for them! Now we have a better understanding of why Satan is the author of confusion! Predestined before creation (Eph. 1:4-11). “THE MYSTERY of Christ” sets the record straight. Wally takes us through deep biblical revelation of how “the Lamb’s” blood was shed from before creation (Rev. 13:8). That was His plan! As Christians we find ourselves bombarded with questions. Questions that non-believers tend to exploit with the intention to discredit the extraordinary love and greatness of God as well as the full depth of the sacrifice Jesus made. In his book, The Mystery: Heaven’s Secret Story, Wally Wood masterfully examines and reveals the truth within The Truth. A mystery so simple yet so profound that it is literally hidden in plain sight. Chances are, you have read scriptures containing the answers to the secret mystery and still have no idea! This book has helped me to develop an understanding of the seemingly unknown fundamental reasoning behind ALL CREATION. Fundamentals that surprisingly mirror many popular scientific theories. For newborn Christians as well as biblical scholars, this book will fill in the blanks for those questions that (whether you admit it or not) you just don’t know the answers to. Does anyone have the video link to the “In His Presence Prophetic Conference”? David — this is Wally Wood. You can view the full video session of the conference on IHP’s YouTube channel. Go to https://www.youtube.com/user/ihpministries. Hope this helps. You’ll find my session here: “The Prophets Speak Conference 10:00 A.M. July 23 2016 service” — https://www.youtube.com/watch?v=JkohP4t7Y9w. Be blessed in the teachings of this conference. Thanks for writing. Thank you, Page, for checking in and for your kind comment. Come back often and check the full site when you have time. Hope to see you soon. Wally is truly anointed by OUR HEAVENLY FATHER! God bless you Wally and may God keep you safe and strong so you can reach the whole world!! !